Since moving to Gloucestershire a couple of years ago I have been trying to build up my knowledge of where the best local pies can be found. It has been a bit remiss of me to only just review Plenty Pies now. The company, based near Nailsworth, have done well at the British Pie Awards the last couple of years including winning the award for best chicken pie in 2014. 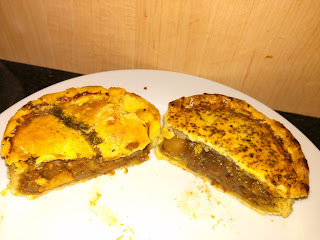 Now, having tried a few of their pies I am going to summarise my thoughts with help from our vegetarian Pierateer ARL who will give the veggie version a fair review. 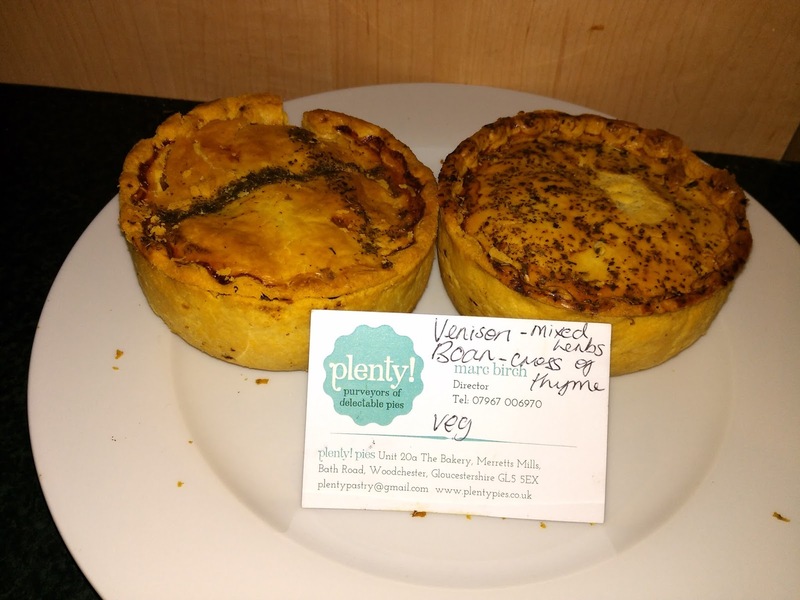 Plenty was started by Marc and Kate Birch in 2010 and they have adopted a policy of baking six different flavours each week from a repertoire which is said to have include 150 different recipes. It allows them to tailor their fillings based on the seasons with creamier, lighter fillings for the summer and stock based recipes for the winter. This method of varying the pie fillings has been adopted by a few top pie producers recently (MyPie and Great North Pie Company spring to mind) and works well. It keeps the pies interesting for their regular customers as well as allowing them to use the tasty, seasonal produce available. They are also committed to making things themselves by hand. All this adds up to a unique pie experience. Their pies are popular locally and are widely available in markets and farm shops. I have picked up their pies in various places in Gloucestershire including Gloucester Christmas Market, Over Farm Market and Burford Garden Centre. All of these pies came in the same kind of pastry case. They were all very well presented with sprinklings of herbs or seeds which signified the flavours. The appearance was subtle but effective. I thought that the size of each pie was good for an individual pie but it is about the size you would expect in this price range (approx £3.99). Whilst in general I enjoyed the flavour of the pastry, it was a bit more crumbly that I would ideally like, some of them did start to break after a trip home in a bag but perhaps I should have been more careful! The Squab pie in particular suffered from the journey home on my bike (sorry about that Plenty). The crumbly texture of the pastry certainly helped prevent it from being stodgy. 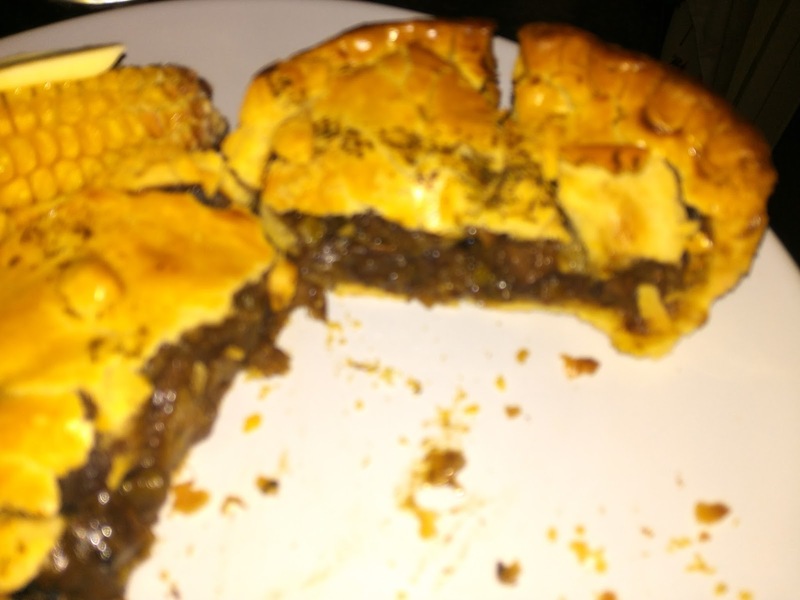 First up I am going to review the interesting Gloucestershire Squab pie I picked up at Over Farm Market (who incidentally have a great range of Plenty pies as well as their own). It is nice to see this traditional local flavour being used. 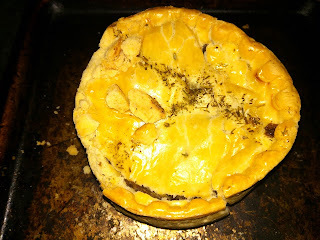 Although a squab is a baby pigeon, in the South West this pie usually contains mutton and apple. It is thought that this unusual combination may recreate the flavour of the baby pigeon which is said to be slightly fruity. I was very pleased that Plenty were willing to try something a bit different with this pie as I really enjoyed it. It was delightfully different with a wonderful spicy/fruity taste complementing the rich meaty flavours very well. I was surprised that I enjoyed this pie so much as I am normally not so keen on mixing my sweet and savoury flavours, but the balance in this pie worked so well. 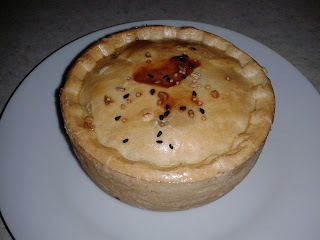 Given that I eat a lot of regular pie flavours, such as steak and ale, it was really nice to have something different. The pie was well filled with plenty of meat. Overall it does enough to gain a Pierate 'Highly Recommended' award by scoring over 6 out of 7. It was £3.99 which is around the upper end I think I would want to pay for a gourmet pie but it justified the price. Next up, I got 3 pies for £10 from Gloucester Christmas Market. It was a great market, with plenty of pies on offer (including Brockleby's who we have previously reviewed) but the display of pies on the Plenty stall stood out to me. I got a Wild Boar pie, a Venison pie and a vegetarian 'Veggiestan' pie. The Wild Boar was my favourite. It had a meaty flavour but also the addition of vegetables made it a little different to most wild boar pies. Something was adding nicely to the flavour of the boar and I wasn't sure what it was, I thought the pepper helped and also I wondered if there was a bit of a tomato. There seemed to be a fair bit of tasty onion. Whatever they had added, the flavour was distinctive and worked really well for me. The wild boar was minced but there was still enough to get your teeth into. The potato was quite firm rather than mushy (as it often is in a pie). One downside was that the pastry was a bit overly thick at the base of this pie but it didn't stop it scoring highly and just about edging it over the Squab pie as my favourite of all the Plenty pies that I have tried. Despite looking superficially similar when I cut these pies open, for me the venison didn't work anywhere near as well as the wild boar. It went down more of the standard route you would expect for a pie containing game meat. It had a really rich, meaty sauce. I am not sure what it was but the flavours were a little too strong for me. There was quite a powerful onion-type taste which I thought was shallot. It also seemed to have a slightly fruity flavour competing with everything else. I also got a very slight sour note to the filling, somewhat like vinegar or alcohol. Overall none of these were bad flavours and I did enjoy the pie, but it didn't quite do it for me for some reason. It contained big chunks of tasty meat which gave it some bite. In that respect it was probably better than the wild boar. It was a shame for this pie that I was eating it at the same time as the wild boar which slightly overshadowed it. On it's own it is still a great pie. 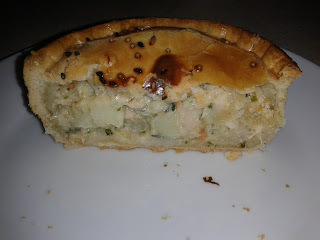 Just to demonstrate the full breadth of their repertoire, plenty have also got a Salmon pie which I picked up from Burford Garden Centre (another place that tends to have an excellent range of pies, sometimes stocking our number 1 ranked pie by Paul's pies). The colour on this pie looks a bit paler but I think this was primarily down to the lighting, it still had an attractive appearance and I managed to squash this one less than the others! Again this was a well filled pie with no air gap. As is usual for a fish pie there was plenty of filler in there as well as the fish. As you might expect, there was some potato but I was pleased to see the interesting addition of beans. It was nice to find that the filling was moist and slipped down very well. If anything, it slipped down a little too well. As is common with fish pies they don't have as much bite. The flavours were quite delicate, especially compared to the other Plenty pies. On balance I think it could have used a bit more salmon to give it enough of a fishy taste. Overall though this was a tasty pie and it can be tricky to get a 'proper' fish pie to work (by proper I mean encased in pastry rather than topped with mash). I commend Plenty for trying and this is a nice, lighter pie to have in the summer. Another high score. I overcooked this pie a little which created a dry pastry, but it still had a good colour. It was completely packed full of filling (chickpea and vegetable), with a slightly spicy flavour- almost a sweet and sour tang. It was a very nice blend. The content was unusual- it was sort of like a fajita in pie form or some other Mexican inspired dish, which I really liked. Many vegetarian pies can be a bit bland so this was a great plus point for it. As for its condition, early in the oven the pastry slit open, however no content spilled out, luckily. This could have been because I was cooking it in an aga so the temperature was too hot, or because it came all the way from Gloucester Christmas Market (I live in Buckinghamshire! ), but regardless, it loses points for this. Although the gravy/sauce was nice, it was quite thick so didn’t soften up the pastry. Despite it’s prolonged time in the oven the carrot was still crunchy. This was fab as I HATE soggy carrot, and I don’t know anyone who does. It is one of the things that makes the traditional cottage/shepherds ‘pie’ a disappointment. The chickpeas were also on the crunchier side, which while ok, were a little bit too hard for my taste. Overall, the pie contained a good selection of vegetables including peas, onion, green pepper, carrot and tomato.